Clay [Properties and Characteristics] . . . . Clay Terms . . . . Interglaze - "An interactive glaze analysis program on the Web." Mimbres Painted Pottery - Brody, J. J., School of American Research, Santa Fe. Albuquerque: University of New Mexico Press [With support from the Weatherhead Foundation]. 1977, 1989. The Mimbres Art and Archaeology - Fewkes, Jesse Walter, with an Introduction by J.J. Brody. Albuguerque, New Mexico: Avanyu Publishing, Inc. [A reprint of three papers . . . . Published by the Smithsonian Institution between 1914 and 1924.] 1989. "Representational Motifs in Minoan Pottery and Seals" in Tradition and Innovation, Essays in Minoan Art. Walberg, Gisela. Mainz am Rhein: Verlag Philipp Von Zabern. 1986. The SDSU CeramicsWeb- "This is an experimental web site for ceramics. It includes such things as databases of glaze recipes and material analyses, links to other ceramics web sites, health and safety information, and a variety of educational materials related to ceramics . . . . The ultimate site for information on all aspects of pottery and ceramics - featuring glaze formulas, glaze calculation software, and links to the vast network of ceramic and pottery-related sites on the web." Clayart - "The ceramic arts discussion list which allows you to exchange messages with fellow potters across the globe! An outstanding resource for all aspects of pottery and claywork. To join (free), send the following e-mail message to LISTSERV@LSV.UKY.EDU: Subscribe Clayart (type in your first & last name as indicated). Within a day or so, you'll receive instructions via e-mail on how to use Clayart, and will begin to receive the daily messages which transpire between all members." Critical Ceramics - "A critical discussion of ceramic art . . . . Articles and reviews on international contemporary ceramic art." Clay Art Center - "Clay Art Center is your source for all your pottery needs. We have "pottery supplies" of all kinds - pottery clays, ceramic glazes, kilns, raw materials and chemicals, molding and casting supplies, potter's wheels, pottery studio equipment, clay working tools, art and glaze brushes, airbrushes, books, videos and more. Along with the items we manufacture, we are dealers and distributors for most of the major product lines used in the pottery industry - Brent Wheels and Pottery Equipment, Shimpo Wheels, Creative Industries Wheels, Laguna Wheels, Laguna Equipment, Laguna Glazes, Northstar Equipment, Pacifica Wheels, Soldner Wheels and Clay Mixers, Scott Creek Extruders, Aztek Airbrushes, Lockerbie Wheels, Olympic Kilns, Cress Kilns, Paragon Kilns, Skutt Kilns, Dolan Tools, Kemper Tools, Duncan Glazes, Amaco Glazes, Amaco Kilns, Yasutomo and Company Brushes, Royal Brushes & Langnickel Brushes, and more." ChinaClayArt - Cultural Exchange between China and the international ceramic art community [Jingdezhen Sanbao Ceramic Art Institute, Artist Residency, Summer School, Travel Program] - "The village potters, studios and kiln sites are incorporated into Sanbao Ceramic Working Village to preserve a classical setting for exploration into the techniques and cultural history of ceramics production in an area which has been the porcelain center of China for almost 1000 years." The AMPHORAS Project	- "This site contains information on plain, unglazed, ceramic storage containers, with two handles, mostly pointed at the bottom, used to carry wine, oil, fish, and other commodities around the ancient Mediterranean." Krueger Pottery - "A commercial site that provides information on glazes, firing and throwing." MSDS (Materials Safety Data Sheets) - Find out the potential dangers of working with your clay and glaze materials. National Council on Education for the Ceramic Arts [NCECA] - "Home page of the non-profit professional organization whose purpose is to stimulate, promote, and improve education in the ceramic arts." Studio Pottery - "Provides information about UK Studio Potters, their current work (and where it can be seen and purchased), exhibitions, demonstrations and work-shops." Pewabic Pottery - "Founded in 1903 during the height of the Arts & Crafts Movement in America, Pewabic Pottery is today a non-profit organization dedicated to the preservation of the Arts & Crafts ideals while advancing contemporary ceramic arts through its full curriculum of educational programs, its support of individual artists, outreach to various communities, and leadership in the exhibition of contemporary and historic collections and archiving of scholarly research - Artist-in-Residence program, student apprenticeships and collaborative projects." Rachel Concho - "Rachel has been making traditional Acoma pottery for over forty years. She learned how to pot in her childhood by watching her mother work. She still gathers clay in the same areas from which her mother and grandmother gathered the earth before her. Rachel gets her pigments from the area around Mount Taylor and applies her designs with the traditional homemade yucca brush. Although she creates many traditional Acoma Pueblo shapes, the seed pot is her favorite form. 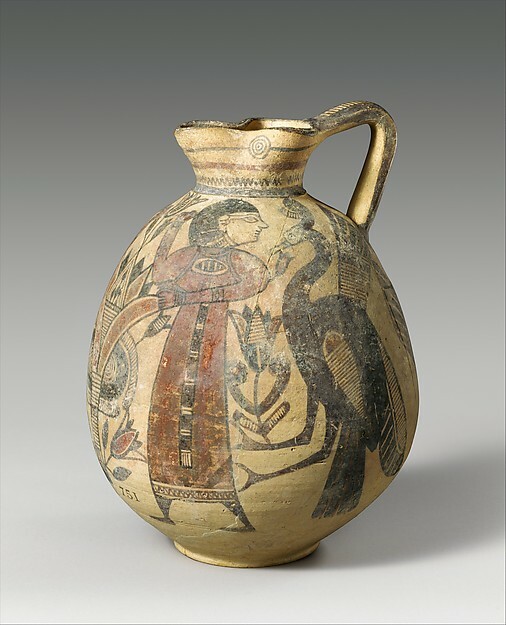 Rachel is the sister of fellow potter Joseph Cerno and the mother of Carolyn Concho, who also makes Acoma pottery." Archie Bray Foundation for the Ceramic Arts - "A non-profit, educational institution dedicated to the enrichment of the ceramic arts, offering residencies and specialized workshops to ceramic artists from around the world." Ceramics Resource Directory - "A complete resource directory of anything dealing with ceramics." American Craft Council - "The American Craft Council is a national, nonprofit educational organization dedicated to fostering an environment in which craft is understood and valued . . . . "
American Craft Magazine - "American Craft magazine celebrates the excellence of contemporary craft, focusing on masterful achievements in the craft media---clay, fiber, metal, glass, wood and other materials---with the goal to create intellectual and visual interest for the reader on today's craft. "This site provides information and resources for both the craft world and the general public in text and images. Visitors to the site will find information regarding the Council's principal programs: American Craft magazine, a comprehensive library of 20th-century American craft, and a full schedule of juried retail and wholesale markets." Birks, Tony. The Art of the Modern Potter, Country Life Limited, London. Cardew, Michael. Pioneer Pottery, St. Martin's Press, New York, 1971. Colbeck, John. Pottery: The Techniques of Throwing, Watson-Guptill Publications, New York, 1969. Grimshaw, R.W. The Chemistry and Physics of Clays and Allied Ceramic Materials (4th ed. 1971). Erikson, Joan. The Universal Bead, Norton Press, New York, 1969. Leach, Bernard. A Potter's Book, Transatlantic Arts, Inc., New York. Nelson, Glen C. Ceramics: A Potter's Handbook, Holt, Rinehart & Winston, New York, 1971. Rhodes, Daniel. Clay and Glazes for the Potter, Chilton Press, Philadelphia, 1957. _____ . Kilns: Design, Construction, and Operation, Chilton Press, Philadelphia, 1968. _____ . Stoneware and Porcelain: The Art of High-Fired Pottery, Chilton Press, Philadelphia, 1959. Richards, Dr. Mary Caroline. Centering in Pottery, Poetry and the Person, Wesleyan University Press, 1970. Robertson, Seaonaid Maini. Craft and Contemporary Cultucre, George G. Harrap & Co., Ltd., London. _____ . Beginning at the Beginning in Clay (pamphlet). Society for Education Through Art, 29 Great James Street, London. Speight, Charlotte. Hands in Clay.